Two inescapable flaws mar the Clinton economic legend. One is conveniently papered over; the other conveniently forgotten. Even so, a flawed legend is better than the economic reality President Obama’s policies have produced, so it is no surprise the sitting President has outsourced his economic messaging to the former President. The first flaw, described here and here, is that President Clinton raised taxes and the economy boomed. The flaw in the narrative is it ignores the passage of time—four years, to be exact. The timeline matters. Clinton raised taxes in 1993 just as the economy was set to take off from a recession, and instead job and wage growth sputtered for four years. The famous Clinton era boom started four years after the tax hike, in 1997, and was triggered at least in part by the Republican tax cut of that year. Four years may seem like a detail, but details like this matter. The second flaw marring the Clinton economic story is recession. 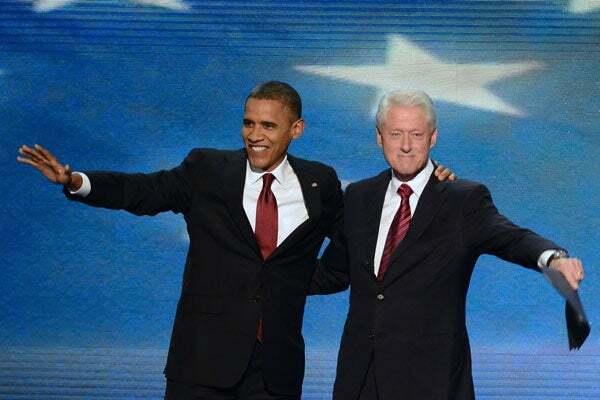 President Clinton did not leave his successor a booming economy. He left President George W. Bush a recession. The recession began in March of 2001, two months after Clinton left office. Even the most rabid leftist cannot blame George Bush for the 2001 recession. It was the Clinton recession. So Bill Clinton came into office and raised taxes on an accelerating economy, and produced a lethargic economy. Republicans pushed through a tax cut in 1997 and thereby launched the famous Clinton boom. Then Clinton left his successor with a nasty recession. And from this is fashioned a legend of economic performance. Damage done on both ends and a prosperity at least shared by Republicans—and yet the legend lives on. Incomplete after four years? More time to press the case for higher spending, higher taxes, and more regulation, all of which have served only to restrain the most prosperity-oriented economy in the world? President Obama can be given credit for trying to apply his economic philosophy with fervor and conviction. His has been an all-in presidency from the start. He tried his best, but his approach failed anyway, as was inevitable; a fact reinforced yet again with today’s jobs report showing an unemployment rate of 8.1 percent and 12.5 million Americans out of work. These statistics don’t tell the whole story, however. The workforce itself shrunk dramatically since Obama took office, as many Americans have given up looking for jobs that are nowhere to be found. The failure was not for lack of thought, or of effort. The failure was assured at the start as a failure of conception. Continuing to follow a bad design can only produce more bad outcomes. In the meantime, with neither a record from the past or a program for the future to tout, outsourcing his economic message to Clinton is about all Obama has left.